This is the fifth post about SharePoint Framework and Vue.js. In this post I want to show how to use React components inside Vue.js-based SharePoint Framework solutions. In previous posts we discussed practically all the steps and tools that you need to develop SharePoint Framework solution using Vue.js framework. But there is still uncovered question that might impact on developer's decision to use Vue.js in SPFx solution. The question is: Can we and How to use React components inside Vue.js projects? Good news everyone! We can use React components inside Vue.js! And it's actually pretty easy to do because there is an open-source project Vuera that allows you to integrate Vue.js and React. And let's see how we can use it in SPF solution. First, let's create our project. I'll be using VueSPFx Yeoman generator to provision all Vue.js references that we need automatically. And let's use Web Part as a playground as it's much easier to debug and render components in there. Additionally, let's reference PnP Reusable controls to showcase how to use these components inside Vue.js web part. Now we have all the configurations in place and let's start development. In the sample project here I want to show you how to referect Office UI Fabric Button, WebPartTitle component from PnP Reusable controls and custom React component inside a Vue.js web part. 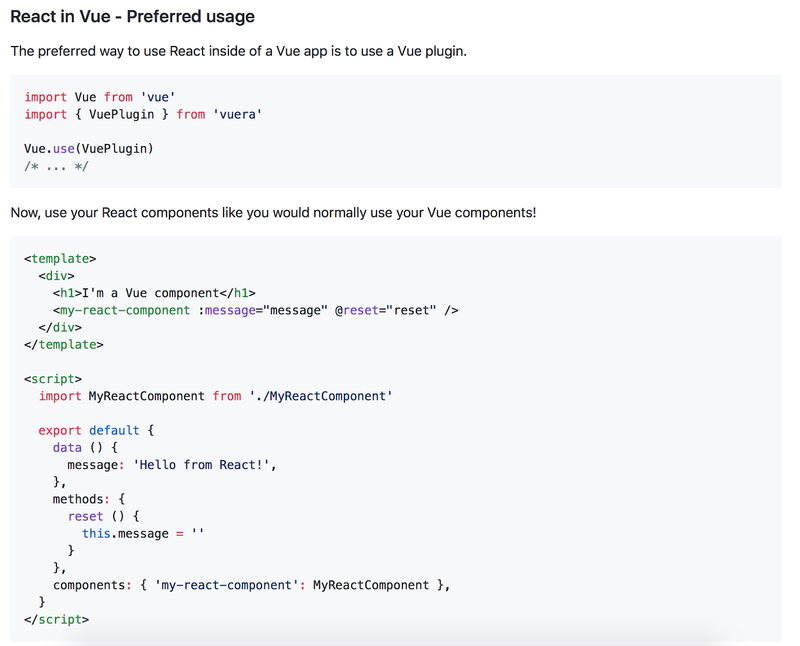 Let's first create a custom React component to reference it in the Vue.js web part. And React components are neither Component nor AsyncComponent that are both Vue.js custom types. Both options work perfectly. I would prefer the second one as you can use custom elements' names in the template for each component instead of using generic react tag and providing actual component's name as a bind attribute. 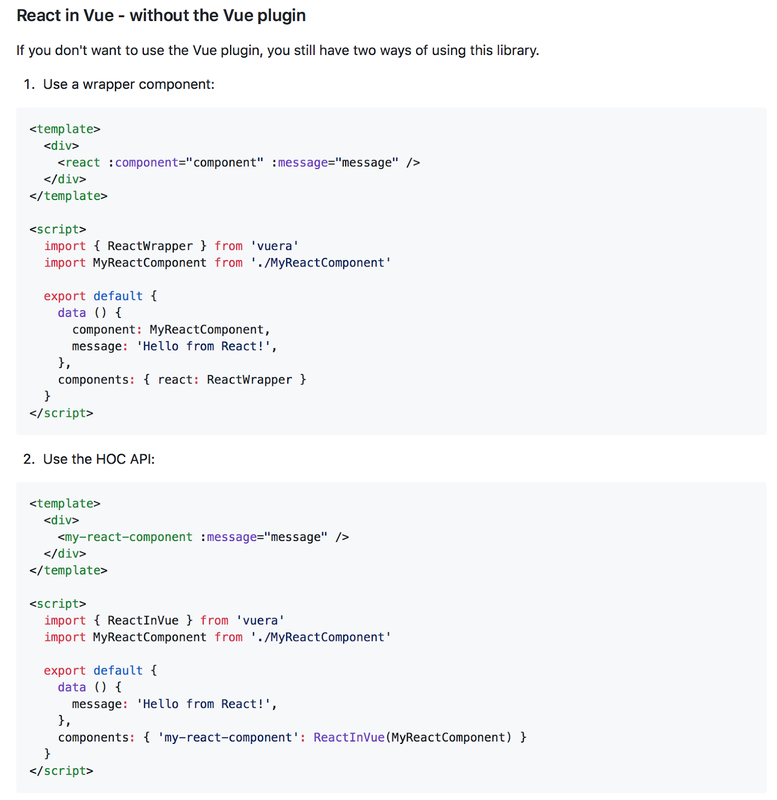 This approach uses custom ReactComponentDecorator that is located in the same repository and allows to mark Vue.js component's class property as "component" and provide its tag and type. Using this custom decorator we can use "recommended" approach from Vuera and no need to use ReactInVue HOC API (Note: it's not necessary to use this decorator, it's just an additional exercise on how to create custom decorators for Vue.js). As a result of this blog post we've created a Vue.js web part that shows how to use React components inside Vue.js SPFx solutions. It shows how to use all the benefits of Office UI Fabric components, PnP reusable React controls as well as custom developed React components in Vue.js applications. If you're in love with Vue.js but consider to switch to React because it simplifies SPFx development, now you can stick to Vue.js and just reuse React controls in the same manner if you'd be a React developer. Unfortunately my assumption that with Vuera you could use Fabric React components (like for instance Label or Pivot) in Vue templates was short lived. Vuera by design wraps every React component and its individual subcomponents or contents used in a template in an additional div with a Vue app attached to it (see for instance issue 26), which at the very least messes up the layout. As you showed, you can use it with predefined compound React components, which is still valuable. But my hope was that Vuera could transform individual React components somehow into Vue components that could be used in Vue templates. Yes, it's wrapping React components into divs, not transforming them. And it should be taken into consideration.